The garganey is also called the cricket teal due to its chirp-like vocalizations. Garganey are omnivorous dabblers that strain their food from the water. They eat more animal prey than other ducks with similar habits. These birds inhabit inland bodies of water, coastal areas, and lagoons in Europe and Asia. They migrate in the spring to their breeding grounds and usually nest within 20-150 meters from the water in meadows, flooded fields, or lowland lakes. Nests are depressions in the ground under tall grasses. Garganey usually breed in pairs or small groups. Garganey are not considered threatened because their population is very widespread. Nevertheless, their numbers are decreasing due to increased human disturbance, disease, nest predation, and habitat destruction. Male garganey are slightly larger than females. Females are much duller in color. Males and females molt, or replace their feathers, and cannot fly for 3-4 weeks during this time. 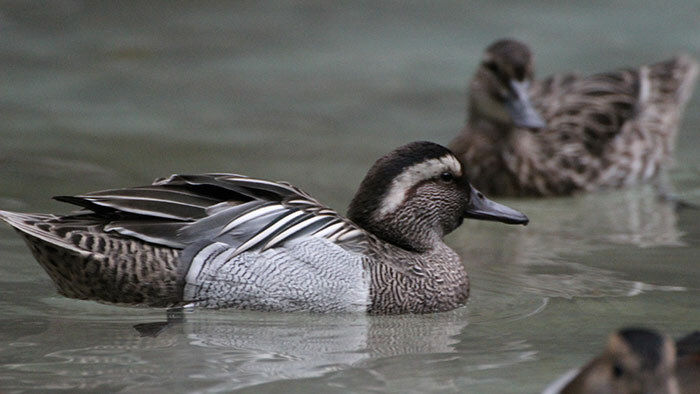 During the breeding season, garganey are highly territorial and small bodies of water may only have one breeding pair. These birds beat their wings so rapidly that they make a hissing noise. They are the only species of duck that migrates to Britain to breed. Grey-winged trumpeter populations are decreasing due to deforestation and hunting. Forests of the Amazon River basin are being cleared for roads, cattle ranching, and crop production. The trumpeter’s poor ability to fly also leaves them prime targets for hunters. Trumpeters are likewise commonly caught and kept as pets due to their natural “guard dog” like behavior. Sherman, P.T., Kirwan, G.M. & Sharpe, C.J. (2014). Grey-winged Trumpeter (Psophia crepitans). In: del Hoyo, J., Elliott, A., Sargatal, J., Christie, D.A. & de Juana, E. (eds.) (2014). Handbook of the Birds of the World Alive. Lynx Edicions, Barcelona. (retrieved from http://www.hbw.com/node/53566 on 27 July 2015). Since opening in 1978, the Minnesota Zoo has successfully raised and exhibited Bali mynahs. 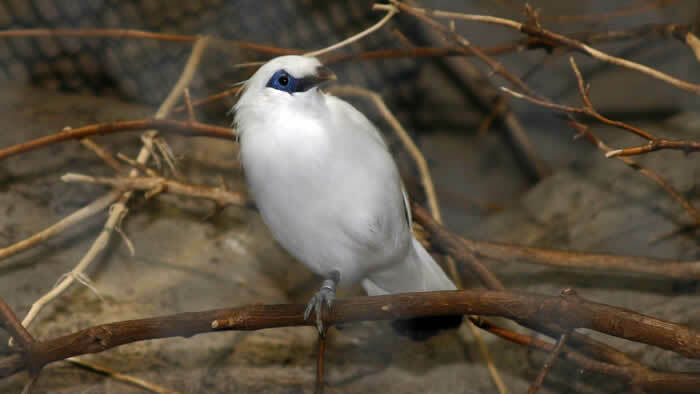 In fact, the Minnesota Zoo has been the single most successful institution for breeding Bali mynahs since the beginning of the AZA’s Bali Mynah Species Survival Plan(SSP) captive breeding program. As of 2012, the Minnesota Zoo has hatched 76 birds that are now part of the SSP. We are proud of our success and contribution to the future of this critically endangered bird. For now, the recent political, financial, and social instability in Indonesia has made releasing zoo bred Bali mynahs into the wild impossible. Fortunately, due to the coordinated efforts of captive breeding programs worldwide, the Bali mynah is in relatively good shape in captivity.